I’ve spent the last week in Northern Ireland, and it has been AMAZING. Other than the Giant’s Causeway I really didn’t know what I wanted to see, but I’m lucky enough to have a best friend with all the right knowledge, and a welcoming family to boot. So I couldn’t have been in better hands. The Giant’s Causeway is totally worth it, but definitely go in a storm so that you can combine fear of being blown into the ocean with actually getting to be the only people on the Causeway. Northern Ireland is excellently provisioned with public toilets. Potato bread is king of the breakfast potato products. I can withstand gale-force winds. Safely make it across a rope bridge suspended above the tumultuous waters of the Irish Sea? Easy. Just walk along a promenade without throwing my own face at the floor? Can’t do it mate. I still know all of the words to “Unsinkable Dream” from the Titanic musical I was in when I was about 12. 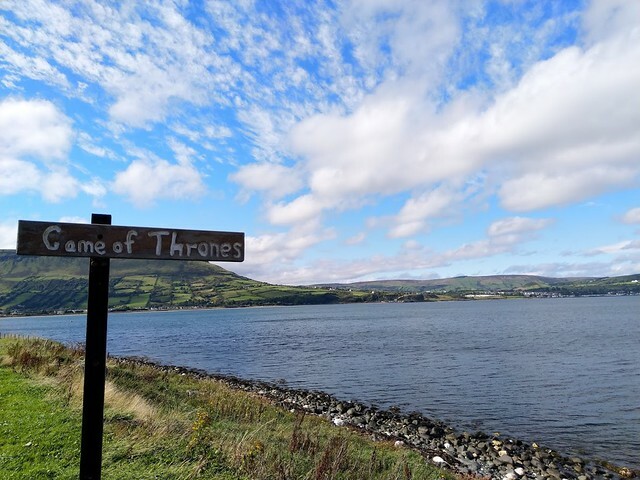 All of Northern Ireland is in fact Game of Thrones. Bear with me today. I have a cold and my brain feels SO HEAVY rattling around in my skull. I’m not sure if any of my thoughts are going to make any sense, but it’s a while since I shared any regardless, so here goes. I’ve been listening to Kintsugi (by Death Cab for Cutie, for the uninitiated) on loop for about the last month. And it’s amazing how when you go back to music you hear lyrics differently, or in a new way. I didn’t love their previous album, Codes and Keys, and I think I gave Kintsugi a cursory listen before setting it aside and deciding that I’d only listen to Plans for the rest of my life. And I mean, how great is that. To recognise that everything about our journey is worth displaying, and that patched-up things can still be beautiful, maybe more beautiful than the original version. The track I’m particularly fixated on is ‘Little Wanderer’, which I maybe didn’t ever make it to on my first listen, or allowed to blend into the background. I have no idea how, because now that I have given it time I’m falling in love. I think that Death Cab construct their tracks perfectly (I’ve always adored ‘Summer Skin’ just for the structure of the piece instrumentally) and Little Wanderer is rapidly climbing to those dizzy heights. I also love it because it reminds me of travelling, and that’s something which I’ve not done for so long, I’d slightly forgotten the joy of it all. Today I went and watched Mamma Mia 2 (singalong, of course) and that also reminded me of travelling, and seeing the world in technicolour, and finding the things you love, and leaving the things you love behind, and knowing that they’ll still exist even if you’re miles away. I apologised at the start, because I knew this post would run away with itself, but here’s what I think I’m trying to capture – I’m so proud of all of my experiences, even the ones which left me a little broken and in need of some repair, and I love having cause to look back on all of the things I’ve seen and all the places I’ve seen them. Here’s to making memories and mistakes, and finding the things you love and knowing that you can go back to them. I am hugely lucky that in my life so far I have traveled a lot, and lived in 3 other countries than the UK. I’m not the most adventurous person, and I do sometimes wish that I’d done more when I was a bit younger (a gap year to Asia, for stereotypical example), but nevertheless I’ve been to about 20 countries so far, across 4 continents. And yet, as I’m reminded every time I have a break from work, there’s nowhere I love more than the British Isles. I’m currently in Cornwall, for the first time in my life, and I’m totally in love. The thing I’ve realised though is that this isn’t a new feeling – wherever I go in the British Isles (specifically selected language because Ireland is AMAZING) I fall head over heels within seconds. We’ve been favoured by the weather in the last few days which of course makes a difference, but I can imagine that in the wind and rain it would be equally as beautiful, if a bit more aggressive. The north Cornish coast is quite stark in many ways, lots of brushland covering the deceptively mobile sand dunes, which until a few years ago routinely buried St Enodoc church, nearby. The house we are staying in is a modern mansion, not quite the Agatha Christie 30s murder-house I had in mind. Still, you can imagine taking tea with the vicar on the veranda, while Miss* Marple examines the body in the study. It’s honestly like being in a novel. Yesterday we visited Tintagel castle – those of you who know me will know that I have a massive soft-spot for a castle – and it was absolutely glorious. If I were King Arthur, I’d have picked there for a castle as well, with astonishing views over the rolling ocean, easily defensible from the mainland, and with a cave underneath for the wizard to live in. What more do you need in a castle? I’m looking forward to a couple more days here, but already resolved that I need to go out in the next few months and see more of Leeds again. Sometimes it’s easy to get stuck into the daily grind, and to forget how wonderful the world is, even just 15 minutes from your front door. See you for some more #hometowntourism soon basically. You’re welcome. What can I say about 2017. It has been a horrible year. Not all of it, of course, in fact a great deal of it has been wonderful. Sometimes it just feels like the bad overshadows the good. I’m very optimistic that 2018 will go the other way. I don’t *do* New Years’ resolutions, because I fundamentally disbelieve the idea that you can begin new things in January. It’s cold, and horrible, and all normal people should want to be constantly wrapped in blankets and fed cheese. That therefore means that these aren’t resolutions, they are just aspirations for my 2018. I would like to smile more. I am irrepressibly optimistic (it’s frankly quite annoying) but I am not sure I really smile very often. This year I’d like to smile more, and find lots of reasons to smile. I’d like to improve my overall health. I’m still very prone to illness (misc) and I still have achey joints, and I definitely believe these are fixable things, with a little work. For years I’ve been trying to learn German, and Greek, and a whole variety of other languages. I’m not sure I’ll ever really learn them (despite the 6 years of university, I’m not a natural linguist) but I would like to try and use them, by going to more places. Lastly, I’d like to learn how to rest. It seems so easy when other people do it, but my brain just buzzes away and won’t let me stop, and actually that’s probably causing the lack of smiling, and the illness, and probably the inability to focus on learning a language to be quite honest. So learning to rest is my final aspiration. Resolutions are a lot of pressure. It’s ok to leave them for a while (I totally stand by April Resolutions) and just begin the year with a few nice aspirations. After all, the one big positive of having a horrible time is that from here, the only way is up. If you don’t love Dr Seuss, you’d probably best leave now. Not that this post has anything to do with Dr Seuss, but it’s just we’ve got fundamental differences in world-view and you’ll probably hate me. I looked down my list of categories while trying to think of something to blog about this evening, and realised how long it has been since I’ve used my Morocco category. Which isn’t really surprising, as social media chose to remind me the other day that it’s 5 years since I’ve been there. And 6 since I lived there, and started this blog. I don’t exactly crave to go back, because holidays aren’t the same as living in a place, and going back is something I’m not very good at. I don’t exactly know what it is in my psyche, but something really blocks me from places that are in my past. I rarely talk to anyone from school, haven’t been back to Fes, and haven’t been back to Granada – despite the fact I absolutely loved them both, and they’d both make amazing holiday destinations. Maybe part of it is knowing that there are so many places left to explore. Why visit somewhere you’ve already seen? Even on this tiny island, there are so many places I haven’t been to, and the wider world? It’s endless. Japan – a colleague of mine went to Japan earlier this year, and it just sounds fascinating and awesome. I loved all of the colours in the souks of Morocco, and I feel like walking around the cities in Japan would be similar. Northern Ireland – I visited Ireland for the first time this year, and it blew me away (as all of the British Isles always do). We didn’t go near Northern Ireland though, and again, I have a close friend who would be an excellent tour guide. Iceland – It looks gorgeous. Chile – we recently discovered a replica of some Chilean protest art at work, and it’s just so fascinating. Despite studying Latin American studies to degree level, I have to confess I’ve never really been interested in visiting until now, but if I could, I’d go for Chile. India – my parents met in India, so there’s a certain romance about it for me. Aside from that, it’s a pinnacle of colonialism, which I find completely incomprehensible and so naturally want to explore (possibly explaining colonialism if we’re honest). Egypt – a few years ago, while I was in Morocco, I would have chosen to visit Syria. Then, while I was in Morocco, the Arab Spring began, and the destruction which has followed, payrolled by a range of faceless entities without the most basic aspects of humanity, shakes me to my absolute core. I am enthralled by the entire Arabic-speaking world, from the cultural melting-pot of the Maghrib through to the Gulf and the Levant, and there is so much I wish I could see. Egypt feels like a good start, but definitely not an end. I’m sure one day I’ll make it round these places. For now, my next holiday is planned for Newcastle. Or maybe Hull. I’ve been away for the Easter weekend. Let me take you there. Imagine, the sunlight cascading lightly across your skin as you gaze out across the beach. It’s not busy, but there are plenty of people, and children shrieking as they play in the chilly sea. Glancing over your shoulder you can see back as far as the peaceful caravan park, and then beyond to the quaint village. As evening draws in, you wander to one of the array of beach-side restaurants for a quick supper and a glass of wine. On the walk home you admire the twinkling of the stars. Now, drop that image entirely from your head, because I went on holiday to Skegness. For anyone unfamiliar, Skegness is a coastal town next to the North Sea on the Lincolnshire coast in England. It could be everything mentioned in my description above and nothing more, but it has a claim to fame. Skegness was the site of the first Butlins Holiday resort. Butlins are purveyors of the seaside holiday experience, which as Brits we are exceptionally proud of. Despite our seeming obsession with going to other countries, ruining them a bit, then coming back and complaining, we have an enduring attachment to the idea of the quaint seaside holiday which arose in the mid-1800s. One might think the attraction of camping is to get away from it all, and experience nature without the hustle and bustle of other people. Not so at the British seaside holiday park. The name of the game is to get a fancy tin, put it as close as possible to as many other fancy tins as you can find, and then hide inside it for a week so you can complain about the nearby tins and their inhabitants while you struggle to stay warm. None of this is to say that I didn’t have a nice time. Yes, I do think a youth (“youf”) may have threatened me as I arrived. Yes, I think a gang of girls shouted at me to “get back to Chelsea”. But none of that matters when you’re spending time with friends, even if it is in a rainy tin. So I suppose today’s take-home message is get some friends, and if you don’t have them then I really wouldn’t recommend Skegness. A couple of days ago a friend of mine asked me “how do you have time to write a blog when you’re doing so many other things?” – I think the proof is in the proverbial pudding, which is that I haven’t posted anything in a month. Sometimes life just takes over. Let me tell you about recent things. Last week I went on holiday to Ireland. I have always been fundamentally jealous of the Irish because they have gorgeous accents and beautiful language, and a heritage which is fundamentally *not English* (more on my dislike of being English later). But I hadn’t really ever been aware of quite how stunning Ireland is as a country, and now I’m more jealous than ever. We started (boyfriend and I) in Navan, north of Dublin, where we had a lovely breakfast and people-watched. From there we visited the Hill of Tara, which according to actual history is very historical, but according to Artemis Fowl it’s a place where fairies go/are, so naturally we had to visit. We then drove across the country to Galway where we stayed in a charming little house. We had two full days around Galway, so we used one for Connemara National Park, and one for the Burren. Unfortunately our Connemara day was a bit grey and grumpy, but our day in the Burren was fantastic. We saw the world’s 3rd largest stalactite at Doolin Cave, which was fascinating and awesome (note: potholing is insane), stood at the top of the Cliffs of Moher, and went exploring at Poulnabrone dolmen. Basically, rocks are great. Next step was travelling via Limerick (stopping in at King John’s Castle) to near Cork, where we stayed in a fantastic place with the loveliest couple and their dog Bracken. We explored Killarney National Park, Kenmare (which has a fairy circle as well), and Gougane Barra (which our hosts recommended for a wedding venue, which was obviously hilarious). Finally it was on to Dublin to meet up with friends for St Patrick’s Day. Our journey took us via mini golf (a must for any holiday), and culminated in the weirdest stay so far (in a funny little cottage with the host living outside in a campervan) plus visits to the Guinness Storehouse, Dublin Castle, the Brazen Head, Dublin Zoo, and the statue of Molly Malone. Not to mention the actual business of St Patrick’s Day which included the parade, rain, LOTS of Americans, a pub called Church, Fibber’s Hard Rock bar (inc crazy outdoor pizza), and the Old Storehouse to finish the night with excellent renditions of Mumford and Sons, The Lion King, and Fresh Prince of Bel-Air (to name but a few). This weekend I went to Norfolk for my friend’s hen party (affectionately renamed the shark party because sharks are just better than hens). Many things occurred, but that’s not the point of this post. The weekend involved two long drives (3+ hours each) which are no fun if you don’t have something good to do with yourself. That being the case, I looked on my podcast app for something interesting, and decided that the Skeptics Guide to the Universe sounded right up my street. I was right. It’s fabulous. Anyone with a broad interest in science and critical thinking should head straight over there because I was totally hooked (for about 8 hours total). In particular, I enjoyed an episode I listened to which addressed natural remedies. As a person who is *constantly* ill, I’m always having people tell me to try this that or the other, herbalism, acupuncture, you name it. I’ll give anything a go, to be honest, but I draw the line at practitioners who imply that their trade is somehow equivalent, or even superior, to medicine. There are undoubted benefits to a lot of interesting practices and remedies, but the ones which are the most effective are the ones which have stopped being home remedies – and become proven medical solutions. That is just one of the many exciting things which they discuss, and it is going to be my go-to podcast going forward. And I had a nice weekend too. Growing up as an international kid, it’s easy to see why I think we should remain part of the EU. But for me it really goes far beyond the economic and socio-political reasons why staying is the sensible choice. I, like many of my generation, see myself as a global citizen, not in the sense of being able to go on a gap year to Thailand, but in the sense of feeling a quite minor connection to any nationalist ideals. I don’t really “do” sport, but if I did, I wouldn’t support England or the UK. Unless they were good. Or inspirational. Or the underdog. In fact, I’d be quite likely to support a British athlete, but I absolutely wouldn’t support them because they were British. What does that even mean after all? Since time began we’ve all been wandering into each others’ fields and onto each others’ islands. I know for a fact that I’m a good quarter French, if not a touch more. The only thing which unites me to a British athlete is the fact that the same government agreed to give us both a specific national identity, and when you think about it, that’s really not much. Of course it is much for a lot of people, because having certain identities makes life much easier. I am incredibly lucky that I am not one of the “immigrants” trying to find a home in the UK right now, because just not being “British” is making their lives pretty intolerable. They may have key skills, share cultural and societal values with their neighbours, and may have an extensive amount to contribute to the country, but none of that matters in the limiting eyes of state-centric law. At this point let me state that I’m not an idiot. I know we can’t truly have a free global society. We wouldn’t be able to break the perception that “west is best” and herds of people would move to far sadder and more complex lives as they tried to climb up the ladder towards the “developed world”. It would be chaos. But, dream with me for a second. Imagine a world unified, recognising that we are bound by more as humans than geography and family ties. A culture rich with experiences and unlimited by what colour a certain someone’s passport is. There’s more, once you get into the concept of a world where no corporation can dodge tax, and no criminal can claim diplomatic immunity. But we’re getting ahead of ourselves. The point is, what exactly is so special about being born on this rock anyway? Or marrying someone born on this rock, or having a parent born on this rock, or having the money to buy a bit of space on this rock? We spent centuries taking over everyone else’s land because we were so fed up of being stuck on this silly little rock. And now some self-obsessed red-faced buffoons want to cut us off from it all – and what? We’re going to let them? 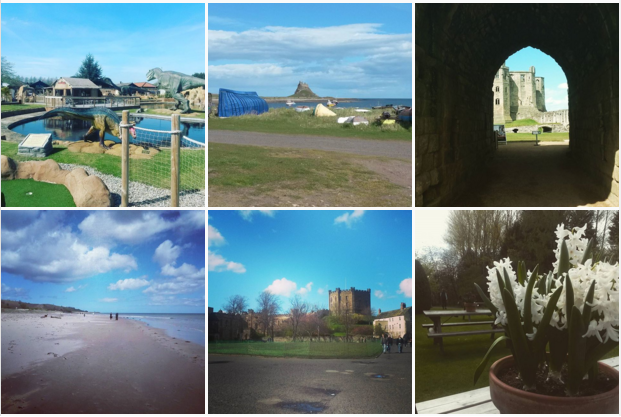 I went on a grown-up holiday, in which I stayed in a fancy hotel, ate 3 course dinners, visited heritage sites, and only played one round of dinosaur adventure golf. I also took several photos, which display my love of castles and sky. Apparently the two things I really value in a photo. I had a pretty charming time all round.